If you were recently in an accident and walked away with a few bumps and scrapes, you may be wondering if your damages legally qualify as a “personal injury”. Since personal injury is more of an umbrella term, many kinds of injury count, but it’s vague enough that it’s easy to get confused. 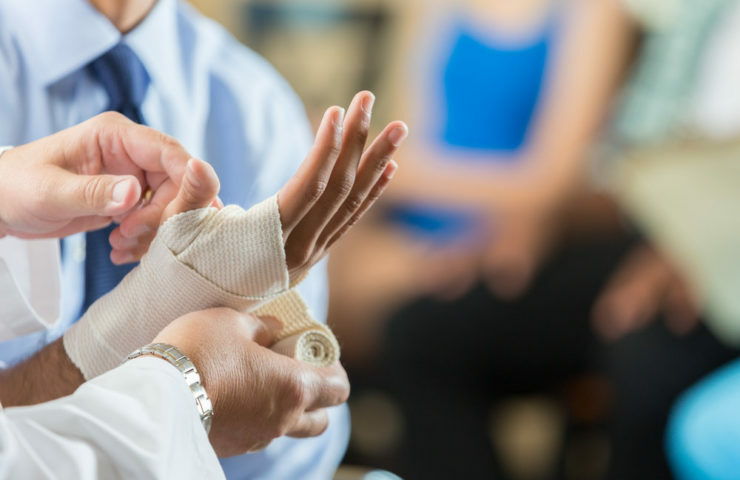 If you want to be more informed about which injuries count as personal injuries, here are a few key points to keep in mind. Compared to other forms of injury, personal injuries are legally defined as injuries in which a person or business could be held legally liable. A personal injury is also a civil action and is most commonly remedied through awarding damages to the victim. Simply put, “damages” are the compensatory measures taken to reimburse an individual for their medical expenses, treatment costs, and other expenditures. Typically, personal injuries don’t stem from any form of malicious intent. This would push your injuries into other categories such as assault or battery. Although these sometimes qualify as personal injury, the premeditated component makes assault or battery more seriously punishable in a court of law. Instead, many personal injury cases are the direct result of negligence on behalf of another individual or entity, especially in slip and fall claims. So how is negligence assessed? Well, whether it’s driving responsibly when you’re behind the wheel of a car or making sure the sidewalks in front of your storefront are clear and free of hazards such as ice, you’re legally obligated to provide a level of reasonable care to your fellow citizens. When you’re injured as a result of someone breaching this level of reasonable care, you’re delving into personal injury territory. It’s no surprise that the number one leading cause of personal injury claims is car accidents. It’s estimated that there are between 20 and 50 million vehicular injuries each year. Imagine how many of those are the result of basic negligence, be it texting and driving, eating fast food while behind the wheel, or fiddling with the radio when the driver should have their eyes on the road. However, there are several “no fault” states where drivers have to collect from their own insurers as opposed to the other driver. Fortunately, as any Bakersfield personal injury lawyer could tell you, California is not a no fault state, so you’re in luck if you live here. Another highly prominent kind of personal injury case is the classic slip and fall case. Property owners and landlords have a legal obligation to ensure that their premises are reasonably safe and that any dangerous areas are properly market, roped off, or otherwise inaccessible. Keep in mind that not all injuries on someone else’s property will qualify as a slip and fall injury. If you’re unsure of whether your injury is worth pursuing in court, it’s best to contact a qualified attorney and set up an initial consultation. If you’ve recently been injured in an accident and think you’re entitled to financial compensation, it’s important to act quickly. If an insurer is lowballing your claim, refusing to pay, or is unwilling to negotiate, it’s quite possibly time to consider further legal action. Technically, you’re able to file a lawsuit as soon as you’re injured, but depending on your case, it might be better to wait and see the outcome of the claims process. However, if you’d like to file a lawsuit, make sure that you do it before the statute of limitations expires. Don’t forget that legal action is often seen as a last resort in these instances. Again, consulting with a lawyer will help you decide on the proper course of action for your specific case. No matter what you decide when it comes to filing a claim or a lawsuit, if you’ve been injured in an accident, your health comes first. Seek adequate treatment, make sure to meet with your physician, and if you’re suffering from any mental anguish as a result of your injury, ask for a referral to a licensed mental health professional. Once you’re certain that your immediate health needs are taken care of, you can contact a lawyer about the next steps in your case.